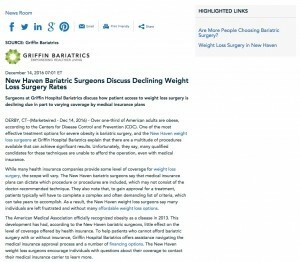 Surgeons at Griffin Hospital Bariatrics discuss how patient access to weight loss surgery is declining due in part to varying coverage by medical insurance plans. Derby, CT — Over one-third of American adults are obese, according to the Centers for Disease Control and Prevention (CDC). One of the most effective treatment options for severe obesity is bariatric surgery, and the New Haven weight loss surgeons at Griffin Hospital Bariatrics explain that there are a multitude of procedures available that can achieve significant results. Unfortunately, they say, many qualified candidates for these techniques are unable to afford the operation, even with medical insurance. While many health insurance companies provide some level of coverage for weight loss surgery, the scope will vary. The New Haven bariatric surgeons say that medical insurance plans can dictate which procedure or procedures are included, which may not consist of the doctor-recommended technique. They also note that, to gain approval for a treatment, patients typically will have to complete a complex and often demanding list of criteria, which can take years to accomplish. As a result, the New Haven weight loss surgeons say many individuals are left frustrated and without many affordable weight loss options. The American Medical Association officially recognized obesity as a disease in 2013. This development has had, according to the New Haven bariatric surgeons, little effect on the level of coverage offered by health insurance. To help patients who cannot afford bariatric surgery with or without insurance, Griffin Hospital Bariatrics offers assistance navigating the medical insurance approval process and a number of financing options. The New Haven weight loss surgeons encourage individuals with questions about their coverage to contact their medical insurance carrier to learn more. Griffin Hospital Bariatrics is a full-service weight loss surgery center with locations in the Derby, Milford, and New Haven area. The weight loss surgery practice is comprised of a team of extensively trained bariatric surgeons and medical professionals dedicated to patient care and results. Offering a comprehensive selection of bariatric surgery procedures and an expansive array of pre- and post-operative support programs, the practice recognizes the importance of every stage of care. Griffin Hospital Bariatrics is well-equipped and recognized as a Center of Excellence® by the Metabolic and Bariatric Surgery Accreditation and Quality Improvement Program (MBSAQIP).